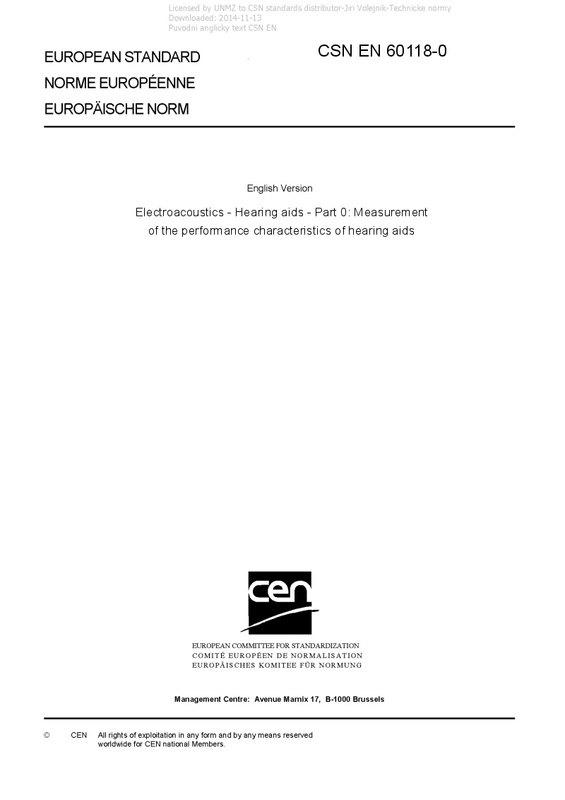 EN 60118-0 Electroacoustics - Hearing aids - Part 0: Measurement of the performance characteristics of hearing aids - IEC 60118-0:2015 gives recommendations for the measurement of the performance characteristics of air conduction hearing aids based on a free field technique and measured with an acoustic coupler. This third edition cancels and replaces the second edition published in 1983 and its Amendment 1:1994 as well as IEC 60118-1:1995, Amendment 1:1998, IEC 60118-2:1983, Amendment 1:1993, Amendment 2:1997 and IEC 60118-6:1999. This edition constitutes a technical revision.